The proliferation of Lean, Six Sigma, and Lean Six Sigma continues to expand worldwide to every type of organization. Experienced practitioners and belts continue to be in high demand. Roles like value stream manager, Kaizen event leader, Black Belt, Green Belt and others are now commonplace. As you would expect, organizations want to tailor improvement and training to their needs. The resulting variation in terminology, training, certification, and applications has led to inconsistency in performance and success (good and bad) both by individuals and organizations. There is often confusion over terminology and definitions. Training time, depth, breadth, content, toolsets, and instructor/coach competencies vary widely. Even within organizations successful with Lean Six Sigma, standardization and consistent performance have become a problem. The simple answer is to provide standardization and consistency. Experienced improvement practitioners know, that to improve a situation, you need to start with a baseline standard. There are many places one can focus with standardization from a Lean and Six Sigma standpoint. From a manageable scope standpoint and the greatest need, a realistic and reasonable starting point is training – particularly Lean Six Sigma Black Belt Training. Black Belt training is indicative of the wide variation in content, depth, delivery methods and length of Lean Six Sigma training. Unfortunately, not every training program and resulting Black Belts are equivalent. Advertised training time can vary from eight days to five weeks, and certification can even be achieved without any training or coaching. The frequent watering down or total absence of training continues to diminish the credibility of practicing Black Belts. Many would consider creation of a Black Belt Training Standard a difficult task. The challenge is to balance two contradictory states: standards that reduce variation and meet minimum performance standards, but also provide the freedom and flexibility to adapt Lean & Six Sigma to specific situations and evolving practices. An organization was formed to tackle such challenges. 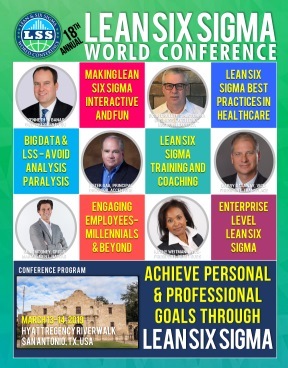 The Lean & Six Sigma World Organization is a non-profit organization formed by practitioners interested in creating an independent, widely accessible, worldwide resource for establishing global consistency and communication in Lean & Six Sigma. Better and more consistent applications of Lean, Six Sigma, and other improvement principles will enhance organizational performance, individual competency, public good, and customer satisfaction. Everyone working on behalf of the Lean & Six Sigma World Organization and the Lean Six Sigma Black Belt Standard committee are volunteers and practitioners. The organization is actively seeking practitioners who are willing to deploy the standard and contribute to its continued success. You will receive a download link to the PDF via email within a few minutes of your purchase*. The PDF will be stamped with your email address - this is to provide you with an individual license for the Standard. *Make sure you enter the correct email address, and verify that your spam filter is not blocking any gumroad.com domains.